Group camps are perfect for family reunions, scout troops, and groups that want to set up multiple tents in close proximity to one another. All sites have access to toilet facilities, and a few group camps are open year-round. 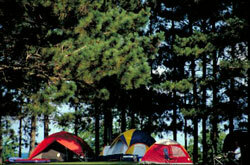 Check the Group camp fees page for rate information.